I've lost another .6 pounds. It's been a good day. This morning, Paul and I took our Pops with a 10 oz. 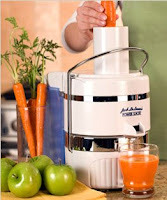 glass of freshly extracted juice (carrots, celery, tomato and apple). (Note: In regards to the Pops, I take a purple in the morning and a green before going to bed.) I was very hungry around lunchtime but once I drank a bottle of water, I was fine. Weight: 227.2 / Total Lost: 13.6 lbs. Jackie - Thanks! I appreciate it.